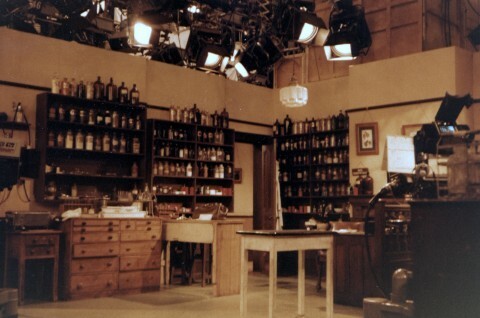 Studio A had a lot of drama series, and one off plays, as in those days drama was more often than not recorded in a studio. Exterior shots were done on film for the most part, and played in from TK during the recording session. One of the early drama series was The Brothers which was a fairly dire soap opera about a set of brothers who owned a lorry transport business. I remember virtually nothing about the series apart from the lovely Lisa Goddard, but it was a regular booking and kept us all in employment. Rather more interesting were the Dickens classics – Martin Chuzzlewit and Nicholas Nickleby. Then there were several series of All Creatures Great and Small adapted from the James Herriot books. The first few with Carol Drinkwater, and the later series with Linda Bellingham, as James’ wife Helen. Then there was Gangsters which was I think the first studio production to use a “handheld” camera. The camera was a Bosch Fernseh, which had a quite large camera on a shoulder pad, connected to a back pack by a short cable, then the cable from the backpack went to a further CCU which was rigged in TAR. The Camera / backpack combination was pretty heavy, so the cameraman tended to put it all down as soon as the required shots had been taken. There were a number of plays for today, and several series of The Basil Brush Show. The latter was recorded on a Saturday evening with a live audience, but for the afternoon dress rehearsal, several staff members and their children formed and audience so that “Basil” had someone to perform to. My wife and children came on several occasions when I was working in the gallery or TAR. We hosted Playschool for at least one series, possibly two. This may have been around the time when there was a union dispute regarding who was to start the clock! As I remember, electricians said it should be them as it was electrical, and scene hands said it should be them as it was a prop. I don’t remember how it was resolved, but it was that kind of union silliness that set Margaret Thatcher on her crusade against the unions. Studio A hosted Young Scientist of the Year at least twice, and also The Great Egg Race with professor Heinz Wolff. There were several series of Angels a kind of forerunner to Casualty. Then there was the great Pot Black which really put snooker onto the map for the first time. This was recorded over four intensive days after Christmas (27th – 30th Dec) and then shown one game per week. The quote of note being “For those of you watching in black and white, the red ball is next to the green ball, just beyond the black” or something like that. The problem was there was little difference in the grey level of red and green balls, so identifying them virtually impossible. It really was a game that had been waiting for colour. There were just so many programmes that came out of Studio A, the place buzzed with activity. In addition to that there were all the Pebble Mill at One programmes which came from both studio A and studio B gallery, with the cameras in the foyer area or outside both at the back and front of the building, and occasionally on the roof! From the camera rigging point of view it was like an outside broadcast, but with the fixed infrastructure of a proper studio gallery. In early 1975 a pilot programme Pebble Mill at Night was produced. It eventually materialised as Saturday Night at the Mill but not until 1976. This likewise used the foyer area, and depending on whether Studio A had a drama booked in used either Studio A or Studio B gallery. Saturday Night at the Mill had the dubious honour of causing 2 of the big windows to be replaced. I think it was the night that a parachute jump landed on the front lawn, and in order to get some additional lighting, the lighting director (TM) had 2 big lights shining through the long gallery windows onto the lawn. The lights were well back from the windows and he checked that the windows were not getting hot. However they would have warmed slightly. That night after the show we had one of the hardest frosts in a long while, and the thermal stress on the windows caused them both to crack (several hours after the lights had been switched off). The replacement of the windows subsequently featured on a Pebble Mill at One, although what may not have been seen was that the new ones were about 3/4 inch too short! The gap was filled with mastic. Studio B progammes in addition to the regular Midlands Today, hosted the Asian unit New Life programme on Sundays, and Farming, (the forerunner of Countryfile). 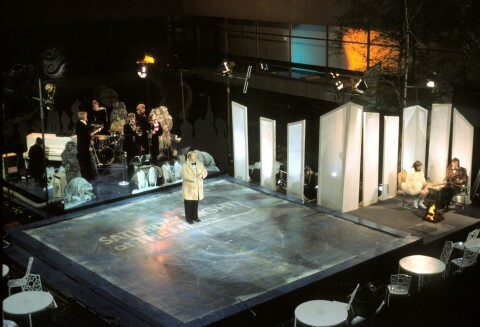 Pebble Mill at One on any days when Studio A was in use for drama, and several programmes that could be squeezed into the small space, including incredibly some with an audience. Sadly I cannot remember all of them but The Clothes Show certainly started off in Studio B. There was rarely any slack days, and Studio B (or its gallery at least) may well have seen at least 2 and often 3 different programmes during the course of 24 hours! The presentation annex was arranged as a self operated area, and close down was done from there every night, with just a couple of engineers manning the TAR end of things. David Stevens was one of the regulars, and used a series of colour slides for his close down sequence. Sometimes the slides jammed in the slide scanner, resulting in a somewhat curtailed sequence. One of the slide scanners took a pair of slide boxes from which the slides were pushed up into the scanner gate by a metal plunger known as the Sprod. Unfortunately this required consistent slide mounts to work properly, and David’s assorted slides were not quite as regular as required, so sometime it spat out a slide altogether, just leaving a blank white screen. When possible the other slide scanner was used for this as the slides were pre slotted into place in a pair of discs which rotated into the scanner gate. The disadvantage of that being that changing the order of the slides took much longer if they needed to be changed. As there were only the 2 slide scanners, and both studios might need to use slides there was a lot of pressure on the engineers to keep them both in working order.